Morning. I wanted to get a Monday Morning Wrap-Up posted yesterday but to be honest our weekend was packing and moving and would have bored you to tears. No one needs to see that. But I am back today with our new home the before tour part 2. And truly the reason I split up the levels of the house is simply because we are doing different things to the upstairs and the downstairs so it just made more sense. The upstairs of our new place has four bedrooms and a loft area. Here is a peek around the upstairs. When you head up the stairs, there is a nice open area which will be the kid hangout space. 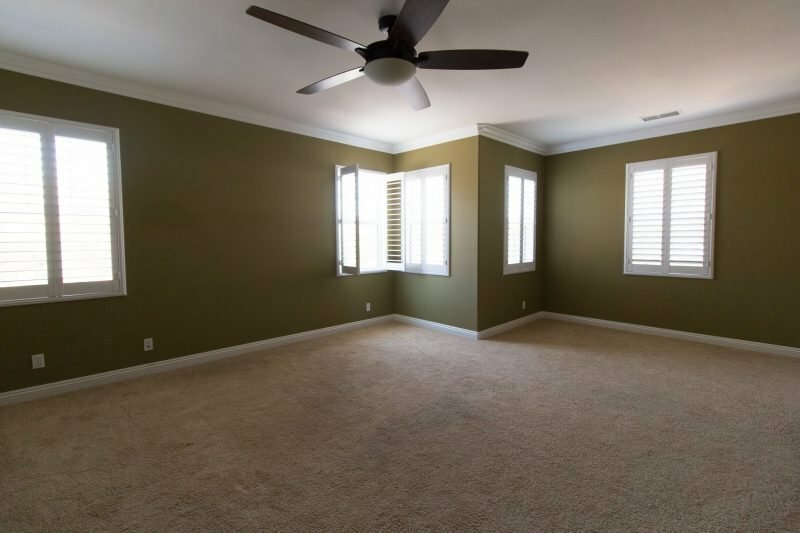 Despite our current home being much smaller, we actually have had a really nice size playroom and that was one of the things on our wish list. It really has been a blessing to have a spot for the kids to run around and be creative. We also are really big on being the house where the kids hang out. I would much rather them bring their friends and hang out at our house where I know where they are! It just feels good to us. The carpet has seen better days and will be replaced. That’s the first thing being done upstairs. What I love most about this space is all of the natural light that pours in. 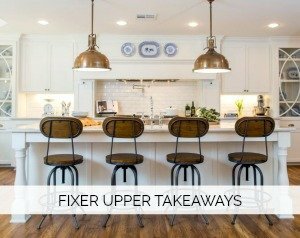 We will also be painting the entire upstairs Pale Oak by Benjamin Moore (same color we did downstairs) to unify all of the spaces and create a clean canvas. Very exited about the flooring choice too and look forward to sharing with you soon. The crown molding and shutters that are in each room are so pretty. Very lucky to have those already. One of the bedrooms. Looking forward to lightening it up with some pale gray paint and new floors. 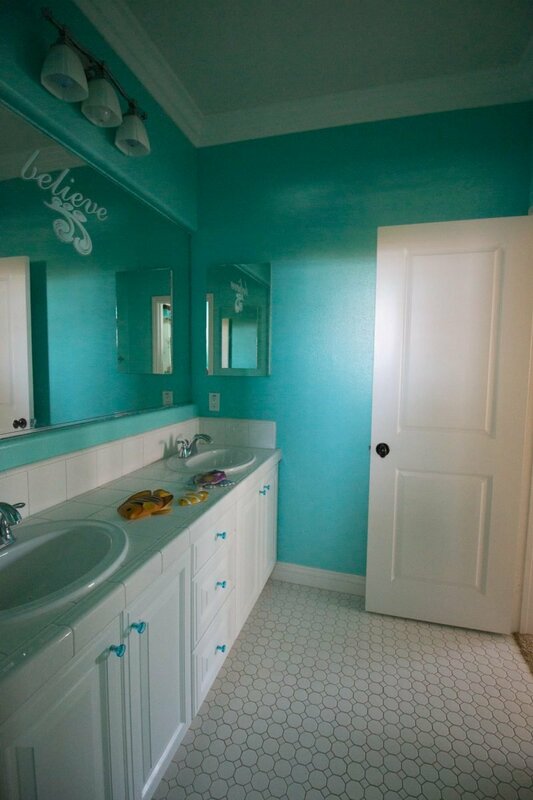 While the turquoise paint is too bold for us, it’s a great bathroom and I really like the classic floor. With some fresh paint and a scrub we should be in business. 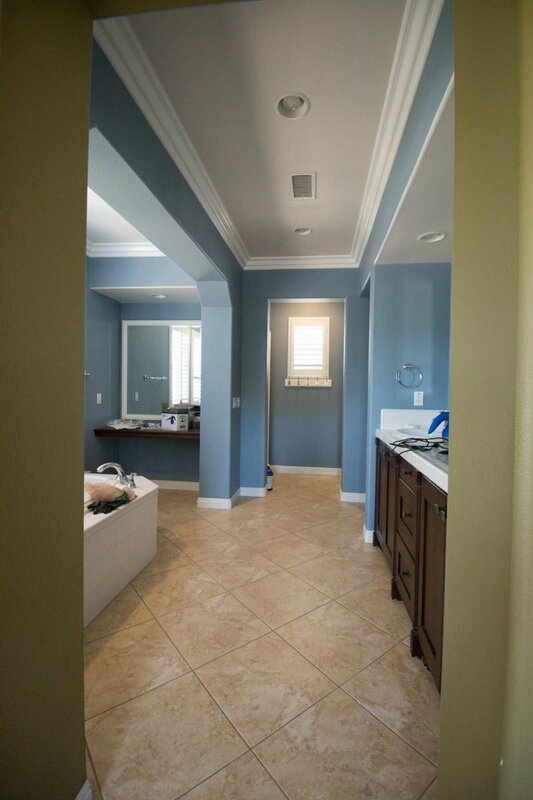 The master bathroom is such a nice size. 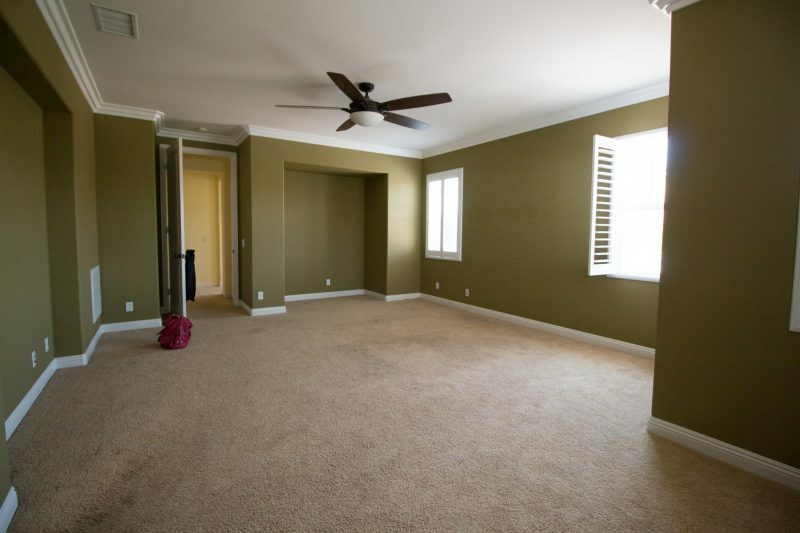 Not even sure how to furnish such a large space. 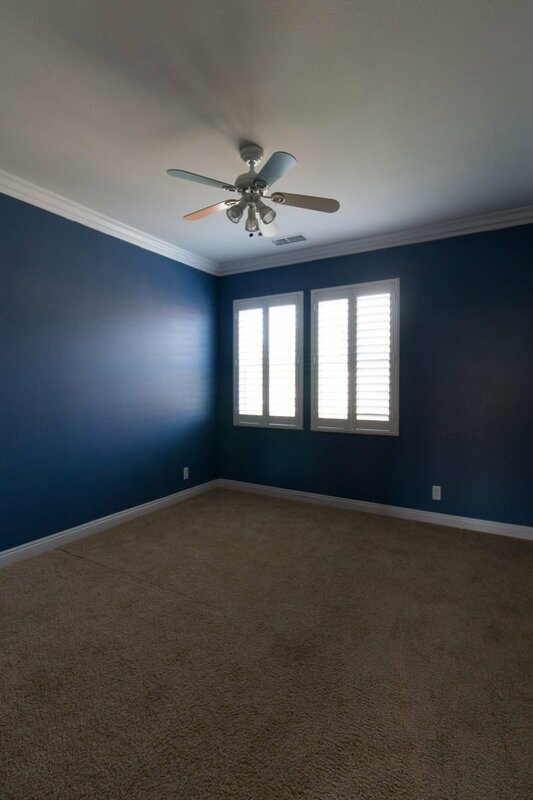 Once again flooring and paint should really lighten things up and add our own style to this room. 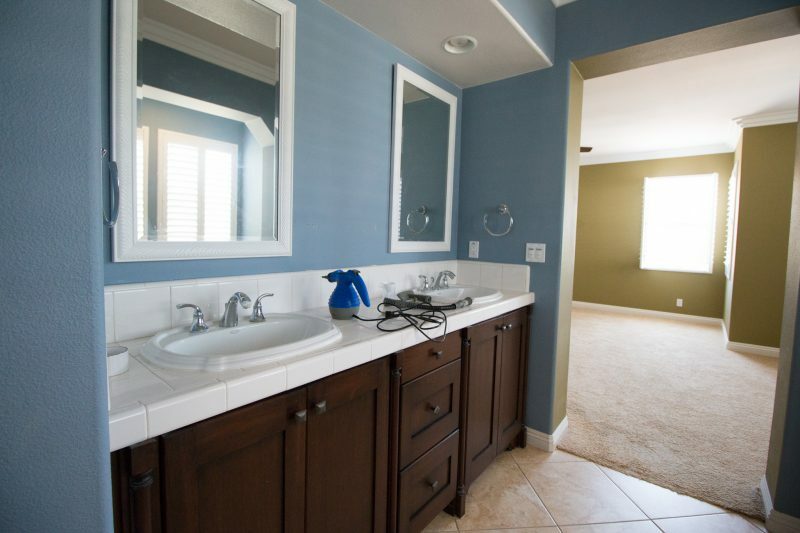 We plan to lighten this room up, too and are hunting down a remnant we own from our previous master bathroom. HINT: If you ever replace a countertop be sure to ask them to save any left over remnants. It is going to be such a blessing to have a piece of quartz we already own and paid for installed. Major money saver. I love that the first thing my daughter brought over was her stereo. Empty room but you can bet Taylor Swift is blasting in this space most of the time. I love that she is excited and looking forward to the change. But I will say that it’s been a bit of an emotional roller coaster and I will share my thoughts on kids handling transition soon. 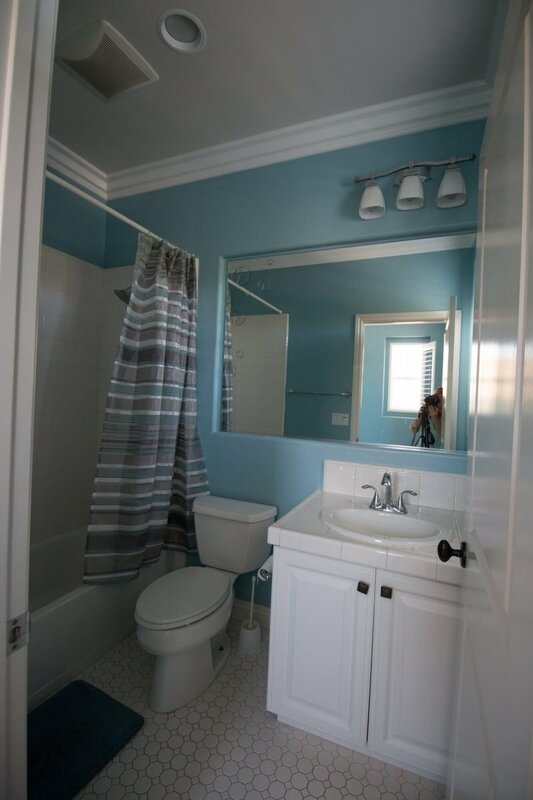 And here is her bathroom. She actually loves the paint color (she has always been my blue loving girl) but we will continue with the Pale Oak in here and then let her infuse a ton of color with towels and artwork. Thanks for taking the tour with us! With some fresh paint it should be feeling like home in no time. I am the biggest believer in paint being the best way to breathe new life into a space and make it feel new again. If you missed the sneak peek of the downstairs you can tour that right here. Enjoy your day. Off to pack more stuff. And by the way. Why is it that when you pack things begin to multiply? I absolutely love your new house and can’t wait to see you make it yours. That bathroom!! I want a soaker tub. Looks just perfect! Can’t wait to see how you transform it! The house has great bones! And yes, a little paint goes a long way to making things fresh and bright. I am thinking of using Pale Oak throughout our home when we paint again. I love a great neutral background. The loft space is awesome. I know you will make it look fantastic in no time. What a beautiful home! It won’t be long and you’ll have it just the way you want it! Looks like an amazing new home!! Congrats!! 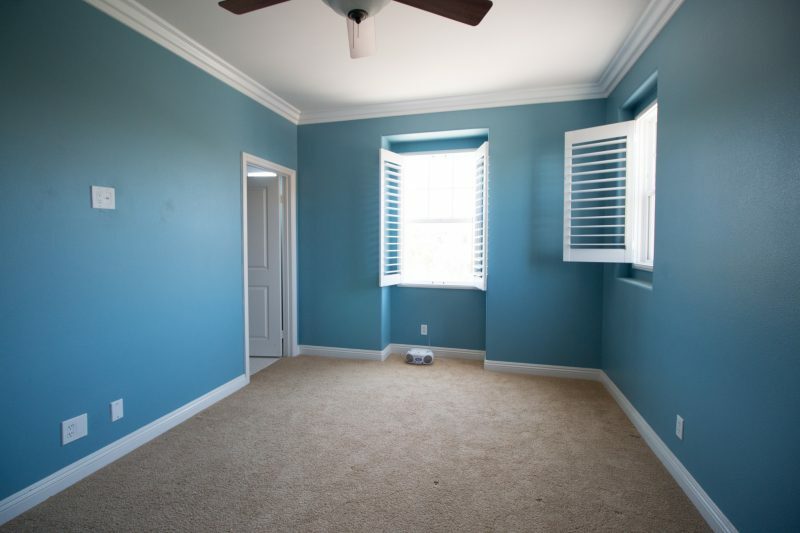 What paint color/brand are you going to use for the light gray in the one bedroom? Such a beautiful home! I can’t wait to see it after you decorate with your things! I love the size of the master and the corner window. There certainly were some odd paint choices and lightening it up with the Pale Oak will make a world of difference. It is so good that you’ve been able to have quite a lot of work done before you move into the house. Great rooms! 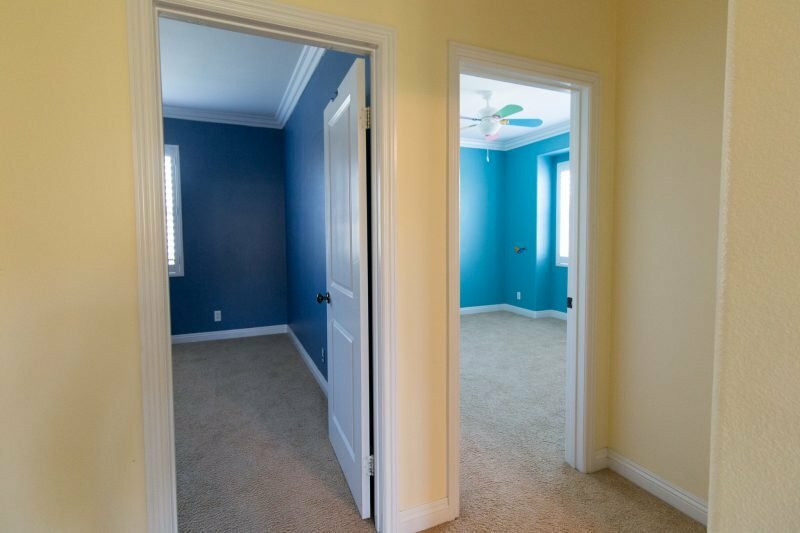 I’m sure the change in paint color alone will make these rooms seem even bigger. can’t wait to see how you transform them – especially the loft space for the kids. Looking forward to your piece about kids and transition . 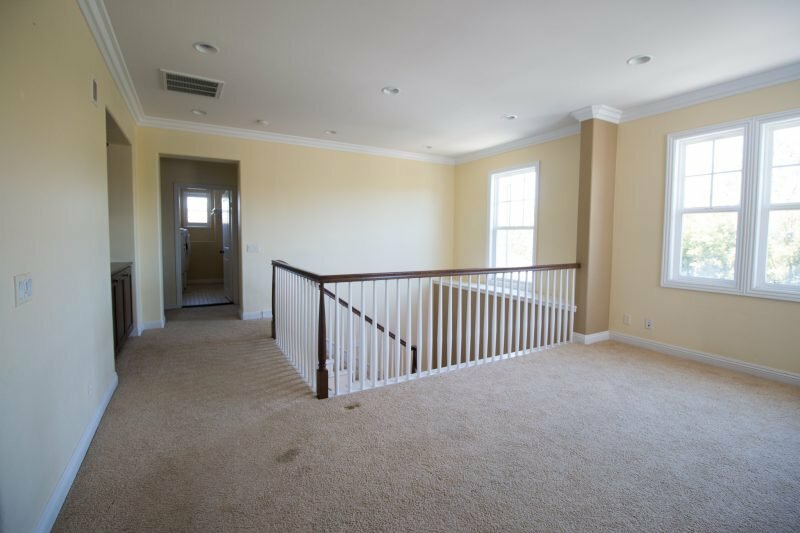 We are currently building a new house and any tips that I can use for my almost 10 year-old daughter are much appreciated. 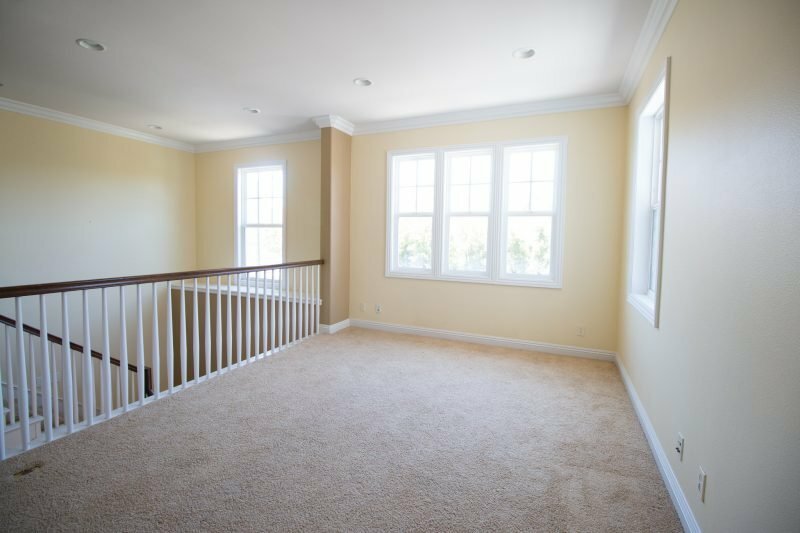 Such a big, spacious and light home – love this upstairs area and i cannot wait to see the changes you make!!! 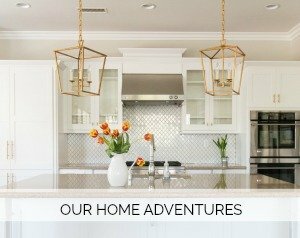 Your new home seems beautiful! I can’t wait to see updates as you make it your own! I am soooo excited for you!!! Can’t wait to see the new look!